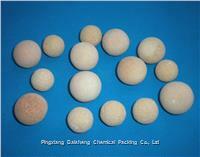 Refractory ceramic balls are made from industrial alumina and other raw refractory materials, and processed by mixing, shaping and firing. 3.Excellent resistance to high temperature up to 1900℃. and heat transformer in iron and steel industries.